Hedge wizards and minor magicians - condemned to the limited powers of rigid Paths and subtle phenomena. Without Awakening, they cannot grasp the true potential of magic - but they're far from weaklings. With careful study and strong will, they unlock power without risk of Paradox. Now that the Reckoning has come, even sorcerers are needed in the Traditions. Whether wizards, visionaries or psychics, these crafty humans are more than mere mortals. 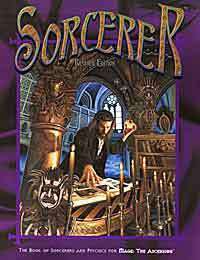 Revised and updated, this volume elaborates on the powers of subtle sorcery in the new Mage Revised Edition line. Here you'll find rules for the various Paths of study, sorcerous Rituals and the Merits and Flaws of visionaries, mediums, and sensitives. Plus, techno-sorcery, exceptional science, psychic phenomena, magical heritage and more, all under one cover at last and suited for those who are a little more than human but still careful enough to escape the scourge of Paradox. If I buy the PDF on one computer, can I still download it from other computers or is it limited? I always found the power-level of Sorcerer to be easier-going roleplay than Mage. Though i still have some fondness left for the Verbena, Euthanatos, and Neph... I mean stuff. I would hope to get it combined with 'Tales of Magick: Dark Adventure' & I remain certain that empowered Sorcerers are much easier combined with WoD vampires or a less violent prone Werewolf story.